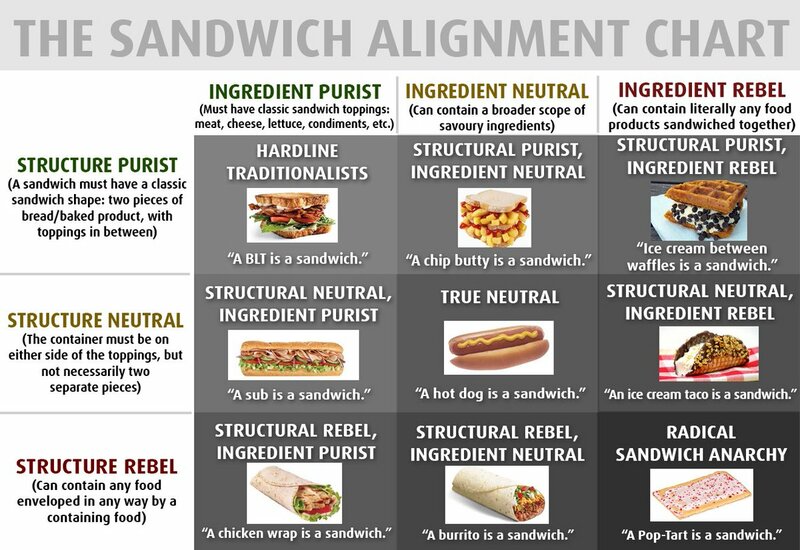 I think I could teach a terrific law class around the sandwich alignment chart. Students so often underrate the problem of assigning meaning to (or deriving meaning from) words. For what it’s worth, temperamentally I seem to be mostly an ingredient purist, except that I would count a burrito as a sandwich. I might count myself as more ingredient neutral, in that a chip butty does look like a sandwich, except that they are so disgusting no one should eat one. I should also note that there is actually a case about this exact issue, White City Shopping Center, LP v. PR Restaurants, LLC, 21 Mass. L. Rptr. 565 (Massachusetts Superior Court for Worcester County, 2006). There was a shopping mall agreement that allowed a Panera Bread franchise to object to the opening of businesses in the mall “that primarily sell sandwiches”. The issue was whether a Qdoba, makers of burritos and tacos, was caught by that provision. Judge Jeffery Locke held that–at least as regards the interpretation of that contract–a burrito was not a sandwich. For more on the issue see Marjorie Florestal, Is a Burrito a Sandwich? Exploring Race, Class and Culture in Contracts, 14 Mich. J. Race & Law 1 (2008). Some people think words have absolute meanings. Others think they are cultural. I tend to the cultural, but recognize that some legal documents, like contracts, should be interpreted to fix a meaning in a time and place. The hard question is to what extent our Constitution does that, and to what extent either its framers, ratifiers, or inheritors rightly treat those meanings as evolving over time. Our first year class is up about 30% and LSATs are (officially) the same as last year. In fact, they look a bit stronger, but not enough to move the US News needle. If the trend were to continue, however, we could potentially raise them next year. We matriculated more than 310 students this year; last year we matriculated about 240. We’re told that all the other indicators, e.g. minority enrollment 46% (dominated by Hispanic students), also are basically indistinguishable from last year. I gather that 2L transfers in were also notably higher than transfers out — although the #1 student in the class inexplicably chose to transfer to Yale Law. These astonishing and (to me at least) unexpected admission numbers are good news — great news — for the law school’s finances and near-term future. Last year, despite suffering a smaller drop in applications than the national average, we under-admitted to keep up academic standards. This year thanks to increases in applications and in yield over last year we did not need to do that: we now have approximately the number of students in the first year class needed for long-run financial health at steady-state — at a size considerably smaller than our peak 1L classes. Those used to run at a gargantuan 380 … and sometimes more when yield fluctuations caught us by surprise. I hope, of course, that these numbers translate into good news for our graduates three years from now. That means work for them, and for those of us on the faculty too. In one way, however, the numbers are not quite as great news for me: there are 41 students in my Torts class where last year there would have been 30. It’s a bit more crowded in there. The interesting question, though, is why? Why were our applications and yield and up so sharply this year, in what I expect must be well above national trend given the number of LSAT takers? To have any shot at a better guess, I’ll need to know more about the national data. I hear rumors of a diverse set of outcomes at other law schools — some also did well some not so well. We have some nice new programs, but they’re small; the football team is doing better, but it still doesn’t feel quite like championship material, so those traditional explanations seem insufficient to explain a jump of this magnitude. I do know that our Admissions office worked really, really hard, but then they worked pretty hard last year too. The law school gave out more scholarships, which also must have contributed to the jump, although from what I hear we are nowhere near what Brian Leiter suggests may be a national average of 48% for private law schools. Whatever the reason for Miami Law’s enrollment rebound, I’m happy about it. I just wish I knew the cause so I could bottle it. How did your law school do? Would You Like to be My Research Assistant? I would like to hire a UM Law student to be my research assistant for 10-15 hours/week during the coming semester. If things work out we might continue into the summer and/or next year. The work primarily involves assisting me with legal research relating to papers I am writing on privacy and on Internet regulation. I need someone who can write clearly and is well-organized. If you happen to have some web or programming skills (some or all of WordPress, HTML, MySQL, Perl, Debian), that would be a plus but it is not in any way a requirement. The pay of $13 / hr is set by the university, and is not as high as you deserve, but the work is sometimes interesting. When you are free to start. A copy of your resume (c.v.). A transcript of your grades (need not be an official copy). If you have one handy, also attach a short NON-legal writing sample. If you have none, I’ll accept a legal writing sample (whatever you do, though, please don’t send your L-Comm memo). Philosopher Robert Paul Wolff dreams about what teaching would be like if profs acted like doctors.